The Citroën Total World Rally Team crew of Sébastien Loeb and Daniel Elena claimed victory in the Rally RACC Catalunya today with a winning margin of 24.9 seconds over team-mates Dani Sordo and Marc Marti. 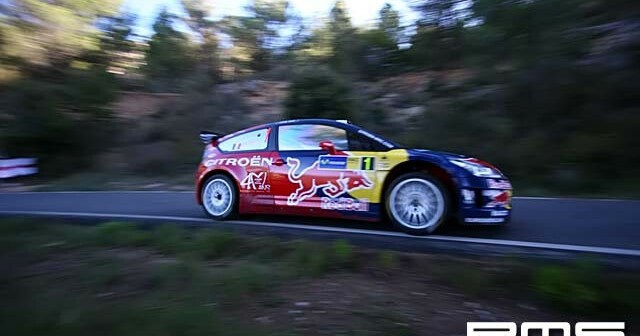 This is Loeb’s 45th WRC win and the team’s third consecutive one-two finish with the C4 WRC. Third position was claimed by Mikko Hirvonen and Jarmo Lehtinen (BP Ford). In the FIA World Rally Championship for Drivers, Loeb extends his lead over Hirvonen to 12 points with three rounds remaining. Dani Sordo retains third position. In the Manufacturers’ Championship, maximum points for Citroën Total gives it a 27 point advantage over reigning Champion BP Ford. Today’s route took in another two loops of three stages and was the shortest day of the event covering 93.88 competitive kilometres. With a 27.7 second advantage going into the final day, Loeb could afford to ease the pace and the Frenchman only won one of the six stages. Sordo also claimed a stage victory, but he too was in a relatively comfortable second position throughout the day. Hirvonen – Loeb’s closest rival in the Drivers’ Championship – moved into third position this afternoon, team-mate François Duval surrendering the position as the Finn continues to fight for the world title. Estonian Urmo Aava had been on course for a top finish, before losing time with broken steering and then an excursion off the stage. He ultimately retired. As a consequence, Petter Solberg (Subaru) took fifth position ahead of Jari-Matti Latvala (Stobart Ford). He was in the thick of a battle with Chris Atkinson (Subaru), the Australian finishing just 1.1 seconds behind in seventh. Norwegian Andreas Mikkelsen rounded off the top eight. The FIA World Rally Championship crews now head directly to Corsica for the Rallye de France – Tour de Corse (9-12 October), the final sealed surface event of the 2008 series.